I arrived at Cap Haitien, in North Haiti, on Saturday, April 21 with Drs. Joe Costa, Joe Babiarz and their team (they will submit their team report). I was accompanied by Dr. Phil Abbosh from Philadelphia. He was on his first trip to Haiti and wanted to become involved with teaching urology in resource-challenged countries. We were greeted by Dr. Jean-Geto Dube (urologist and Executive Director, Hopital Universitaire Justinien) and urologist, Dr. Jory Desir. The afternoon was spent preparing OR’s, and organizing equipment and supplies. Among the abundant OR supplies brought by the team, Project Haiti also donated a desperately needed electrocautery machine (from Prairie Lakes Healthcare System in Watertown, SD), a Stryker camera box with camera (from Stryker, Inc.) and a flexible cystoscope. An enjoyable dinner that evening with our Haitian colleagues was followed on Sunday by a day of patient evaluation and teaching to the Haitian residents. They were instructed in the proper retrograde urethrogram and voiding cystourethrogram techniques for evaluation of male urethral strictures. Drs. Costa and Babiarz scheduled their cases for the week. On Monday morning Dr. Abbosh and I flew by charter with Missionary Aviation Fellowship to Les Cayes on the south peninsula. There we were greeted by Dr. Gaby Nelson and after a quick stop at our hotel, we were taken to Hopital Immaculee Conception (the public hospital) in Les Cayes. Our objective was to proctor Dr. Nelson in the technique of transurethral prostate resection (TURP) over the next 3 ½ days. 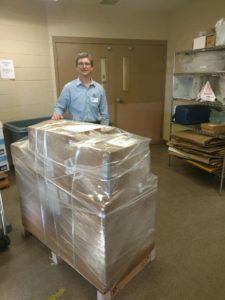 On my last trip to this hospital in the summer of 2016 I delivered the generous Karl Storz donation of urological instruments and a camera / monitor system. 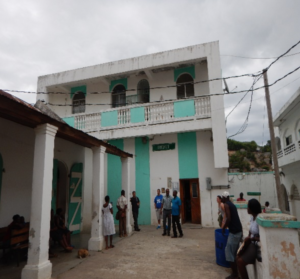 At the time we did TURP cases with Dr. Nelson which he continued under the tutelage of Dr. Aubourg, a senior urologist who works mainly in the Leogane area. They did a number of procedures together, however, Hurricane Matthew hit in October 2016 and the OR’s were devastated. Fortunately, the donated equipment was not affected as it was safely stored in the hospital administrator’s second floor office. With the limited resources in Haiti it has taken until now for the OR’s in Les Cayes to be rebuilt. One of the new OR’s will be specifically designed for urology. Although the new OR’s are not expected to be completed for another 6 months, the administrator allowed us unlimited access to one of 2 functioning OR’s from Monday afternoon through Thursday. During this time we did complete 12 TURPs with Dr. Nelson doing the majority or entire resection in 10 and Dr. Joseph, a young and recently-trained urologist, doing some of the resection in 2. We were joined by Drs. Bernard Brutus, Youry Dreux and Global Philanthropic Committee-funded nurse Japhare Joseph on Monday evening. Dr. Aubourg was also present for most of the cases. The cases went well. Dr. Nelson demonstrated very significant improvement despite very intense (often conflicting!) teaching of those present. It was felt after the last 2 cases (which he completed without help) that he was almost ready to start doing small prostate resections without proctors. Dr. Aubourg has committed to 2 days in May 2018, and Drs. Dreux and Brutus have also made a commitment to return. A devastating occurrence was the sudden passing of one of the patients the morning after his surgery when he got up to wash in the bathroom. He had an uncomplicated procedure, had been very stable overnight with clear urine, stable vitals and normal temperature. 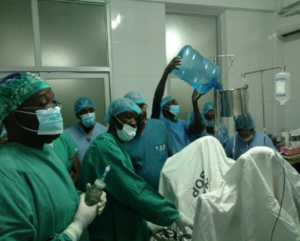 The team assumed pulmonary embolus was the cause of death, and there was discussion about the lack of sequential compression devices and the need for them in Haiti where they are not available. We do utilize subcutaneous low dose heparin after most of our lengthy reconstructive procedures, however, we feel that with the risk of bleeding and significantly shorter resection times, this would not be appropriate following TURPs. The highlight of our stay in Les Cayes was an evening at Drs. Sahmonde and Leno Myril’s home for a terrific Haitian meal followed by Haitian folk songs accompanied by Leno’s guitar. They are a wonderful couple who cherish their family, friends and Haitian heritage. On Thursday afternoon we drove to Port-au-Prince with Drs. Brutus, Dreux and Japhare. We made a stop at Hopital Lumiere in the village of Bonne Finn. It is a 120 bed primary care hospital located high in the mountains of southern Haiti and has been supported by Apostolic Christian HarvestCall. 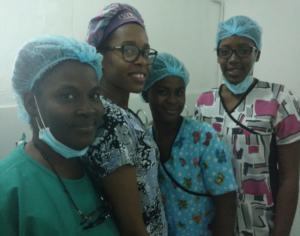 A recent urology graduate from Port-au-Prince, Dr. Garçonville gave us a tour of the facility. He has attended a number of Project Haiti workshops in Pignon and has been working there several days per week. The hospital is very well-equipped and managed. After a meeting with several representatives from administration, we agreed to see what could be done to organize future workshops there. Specifically, TURP and urethral reconstruction were discussed as needs. On Friday morning Dr. Abbosh and I helped Dr. Dreux with a radical prostatectomy at Hopital St. Francois de Sales. All went well and it was a pleasure to show Dr. Abbosh the great teaching facility that we are in the process of developing there. Japhare Joseph continues to grow and impress in her role. She was well-received by the nurses in Les Cayes and has a natural ability to teach and be adored by her peers, physicians, and other health team members. Her organizational skills and pride in accomplishment are evident in the functioning of the urology service at HSFDS. Once again, I was humbled by the commitment of our Haitian colleagues with Drs. Bernard Brutus and Youry Dreux unhesitatingly taking time away from their families and practices to accompany us to Les Cayes. Their comradery and assistance was a reminder of how little we would have accomplished in Haiti without this valuable partnership. We also continue to foster good relationships with the administration of the hospitals visited and this is essential for our ongoing success. We have made new friends and colleagues as Dr. Bill Cleary and his organization, Citizens of the World Foundation, provided professional and competent anesthesia support for the team in Cap Haitien. Their mission aligns perfectly with Project Haiti as they are committed to teaching and supporting anesthetic care in Haiti. They have worked in the north for many years forging close friendships. We look forward to a long and productive relationship with them. 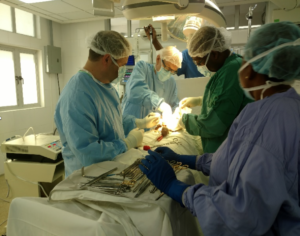 The trip proved to be beneficial for Dr. Abbosh who after this diverse visit to Haiti has expressed an interest in getting involved and sharing his talents with Haitian urologists. Several options for him are in discussion. He has clearly demonstrated that he is a team player with a great sense of humor. He has a wonderful gift of effective teaching and most importantly, understands our mission of improving urologic care in Haiti by teaching and supporting our less fortunate Haitian colleagues.